DMML is a member of the ICL superfamily which is widely distributed among microorganisms including bacteria such as Aspergillus. We report herein QM/MM studies aimed at improving our understanding of the catalytic events that take place within DMML. To this end we have generated density functional theory (DFT)/AMBER QM/MM models to explore the two main mechanistic proposals put forward on the basis of experimental structural data, while we also try to identify which are the most likely acidic and basic residues involved in each scenario. Shedding light on the mechanistic processes at work within this family may open up opportunities to modulate its activity. 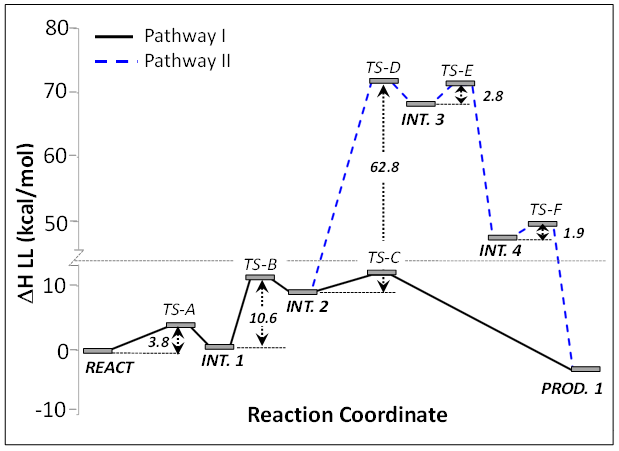 ​Our QM/MM calculations suggest that the most probable pathway involves three separate steps. In step 1, Arg161 acts as the general base that initiates the reaction by abstracting a proton from the C(2) hydroxyl of the substrate. Step 2 involves C(2)−C(3) bond cleavage, which is preceded by proton transfer from Glu191 to the C(4) carboxyl group. This is the ratedetermining step with a predicted barrier of approximately 9−10 kcal/mol. In step 3, Cys124 was identified as the general acid leading to the formation of propionate. It is widely accepted that skin sensitization begins with the sensitizer in question forming a covalent adduct with a protein electrophile or nucleophile. We investigate the use of quantum chemical methods in an attempt to rationalize the sensitization potential of chemicals of the SNAr reaction domain. We have calculated the full reaction profile for 23 chemicals with experimental sensitization data. We find that there is a good correlation between the reported pEC3 and the calculated barrier to formation of the low energy product or intermediate (r2 = 0.64, N = 12) and a stronger one when broken down by specific subtype (r2 > 0.9). Using a barrier cutoff of ∼10 kcal/mol allows us to categorize 100% (N = 12) of the sensitizers from the nonsensitizers (N = 11), with just 1 nonsensitizer being mispredicted as a weak sensitizer (9%). This model has an accuracy of ∼96%, with a sensitivity of 100% and a specificity of ∼91%. We find that the kinetic and thermodynamic information provided by the complete profile can help in the rationalization process, giving additional insight into a chemical’s potential for skin sensitization.